For hospitals and neonatal units, strategically mounted Sound Alerts and Noise Signs reminds both staff and visitors to keep the noise levels down. Sound Alert devices and Noise Signs are usually mounted in the corridors as well as within the unit. 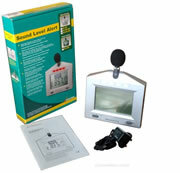 The SoundEar Noise Warning Sign is also very popular in hospitals and on neonatal units.